This study investigates a range of short term memory skills and the effectiveness of memory training procedures in improving these skills. The initial sample was 63 children with Down syndrome, aged 4-18 years, from two geographical areas in the UK. Phase 1 of the study assessed each child on a battery of tests including short term memory skills in different modalities, language skills, speech rate, word identification and a number of general IQ measures. Two groups were formed, one from one geographical area identified as the experimental group (n=25). A control group was formed from a subset of the remainder of children (n=26). Analysis verified that the two groups were similar and matched in terms of age and abilities. Phase 2 of the research consisted of a longitudinal training study of two memory strategies (rehearsal and organisation) which lasted for six weeks. For the experimental group (n=25), a cross-over design was employed to assess the effect of each strategy independently. Half the group received the rehearsal training first and the other half, the organisation-based training. Fifteen children from the group were taught by the first author and the rest by 'keyworkers'. In Phase 3 the initial assessment battery was repeated. The results demonstrated that each training programme was effective and enhanced only those specific memory skills addressed. Broadley, I, and MacDonald, J. (1993) Teaching short term memory skills to children with Down syndrome. Down Syndrome Research and Practice, 1(2), 56-62. Burbridge, D, and Orchard, J. (1993) Teaching Miles in his first year in mainstream school. Down Syndrome Research and Practice, 1(2), 79-80. This article presents a summary of the findings of the first part of a research programme being carried out at The Sarah Duffen Centre in Portsmouth. The findings will be published in full in the future. It follows an article published in the last edition of the journal entitled A preliminary study of sleep disorders and daytime behaviour problems in children with Down syndrome. The first stage of the current research programme has been an extensive survey of sleep problems in a group of children with Down syndrome compared with other children with learning disabilities and non-disabled children.The daytime behaviour of all these children and their mothers' stress levels have also been investigated. This information, as well as associations between sleep disorders, daytime behaviour problems and maternal stress will be reported in future publications. Stores, R. (1993) Sleep problems in children with Down syndrome: A summary report. Down Syndrome Research and Practice, 1(2), 72-74. Daniel is 10 1/2 years old, and has been in mainstream school for nearly two terms, since September 1992. The school is a small C. E. Primary school with 115 children on roll arranged in 4 classes, so each class spans two year groups. Daniel is in year 5, with other children of his own age, and one year older. Previously he was at a special school for mild learning difficulties from the age of 2 1/2 years. Churchill, M. (1993) Moving Daniel to mainstream at 9 years old. Down Syndrome Research and Practice, 1(2), 81-83. If children with Down syndrome have overcome the difficulties with their health in their first years of life, speech development is their main problem area. Research from English speaking countries has proved, that with them one can start with teaching reading at the age of three or four, even before they start to speak, although this sounds unlikely. The advantages are that the very first bit of reading proficiency might be used to increase speech production, to train syntax and to improve articulation. The primary objective here clearly is reading to speak. A case study is presented of a boy with Down syndrome between the ages of 3 and 8. We gratefully acknowledge the use of a video camera and recorder which was donated to us in 1985 by the Philips Company of Eindhoven. What follows can hardly be more of a summary of the experiences we have had in the last five years. de Graaf, E. (1993) Learning to read at an early age: Case study of a Dutch boy. Down Syndrome Research and Practice, 1(2), 87-90. This paper overviews findings from a series of studies of cognitive development in children with Down syndrome aged between birth and 5 years. These studies provide evidence of the persistence and elaboration of a particularly inefficient learning `style' during these early years, one which affects both the acquisition and consolidation phases of learning. The ability levels demonstrated at very young ages were surprisingly high but instead of building on these skills, many children simply allowed them to deteriorate. Consolidation of new skills was compromised by poorly motivated performance on `easy' tasks while the avoidance strategies produced in response to `difficult' tasks resulted in many learning opportunities being missed. Implications of these findings are discussed and in relation to assessment, the importance of awareness of the inherent instability in developmental processes in children with Down syndrome is stressed. Wishart, J. (1993) Learning the hard way: Avoidance strategies in young children with Down syndrome. Down Syndrome Research and Practice, 1(2), 47-55. Buckley, S. (1993) Developing the speech and language skills of teenagers with Down syndrome. Down Syndrome Research and Practice, 1(2), 63-71. 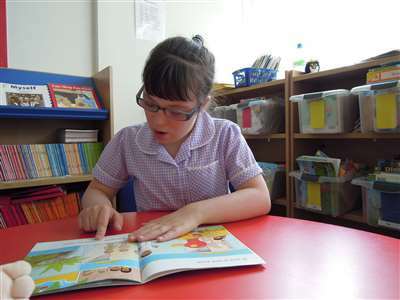 Teachers of children with severe learning disability have found that the National Curriculum has emphasised how communication affects all the subject areas. This has resulted in positive practices developing between education and health professionals. Taylor, G, Dobson, S, and Staves, L. (1993) Collaborative working practices in special schools. Down Syndrome Research and Practice, 1(2), 84-86. Vlachou, A. (1993) Attitudes and the experience of integration. Down Syndrome Research and Practice, 1(2), 75-79.